Futuristic, self-assured, sleek and opulent, that is Singapore for you. What makes this tiny state so unique is its perfect blend of culture, cuisine, arts, architecture and vibrant buzz. Home to breathtaking green covers right in the middle of concrete marvels, temples amidst skyscrapers and the global city of Singapore preserves the old and build the new simultaneously. Be it the opulence of Marina Bay, or the majesty of the Singapore Flyer, or the charm of Bay East Garden, or the cultural richness of Chinatown and Little India, speak to the travel experts at SOTC for excellent Singapore honeymoon packages. From its shopping hubs on Orchard Road, and verdant spaces such as Botanic Gardens, to its effervescent nightlife and the lineup of world-class restaurants, Singapore packs quite a punch! The stunning island city is an idyllic escape for those looking to take in myriad experiences all at one destination. Explore the beauty of Singapore with customised Singapore tour packages. Those who visit Singapore cannot return home without exploring its very own playground – Sentosa Island. With its pristine beaches, world-class attractions, seaports and retreats, it makes for a perfect honeymoon destination. Sentosa Island is a must visit destination on your Singapore holiday packages. It houses the Universal Studios, a Hollywood movie park which offers thrilling rides and other movie-themed attractions. The sea aquarium there showcases myriad fish including stingrays, sharks and seahorses amongst others. You can experience the bottle nose Dolphins from close quarters. This is one of the most popular places to visit in Singapore. Singapore tourism has seen a surge in the recent years for its beautiful and attractive sights. Gardens by the Bay, the largest tropical orchid garden in the world, houses the most exotic variety of plants offering a magical experience. Singapore is a very popular International honeymoon destination. If you are on your honeymoon in Singapore, you can express your love to your spouse amidst the beauty of these stunning gardens and spend great moments of togetherness. On Singapore honeymoon package take a breathtaking river safari that allows you to explore the rich marine life. The romantic river safari will make your honeymoon memorable. Explore Little India and China Town ethnic enclaves that feature distinct Indian and Chinese population and are the hub of shops selling merchandise on the street on your honeymoon package to Singapore. 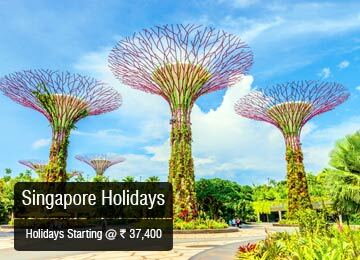 Know more about interesting things to do in Singapore with SOTC Holidays. The best time to visit Singapore is from July to September when the weather is pleasant for sightseeing. The island also offers retail therapy at Orchard Street that is home to the most famous fashion brands in the world. Indulge in retail therapy to make your honeymoon memorable. Singapore packages provide you with a great shopping experience. Go beach hopping at Thailand, catch a stunning sunset together on a romantic evening in Mauritius, go shopping and sightseeing in bustling Bangkok or enjoy blissful moments of togetherness in pristine Bali. Explore these beautiful places with SOTC as we have some of the best honeymoon packages to choose from. Also, browse through our exclusive International tour packages to explore the best places around the globe! What’s Your Theme In Singapore? Singapore is very strict about what is given duty-free concession. Get a clear understanding of the limits and the rules before you go shopping. Singapore has some amazing food culture. From Michelin-starred restaurants to street food, everything here is great. Don’t miss to explore the local cuisine. Use public transport while travelling locally. It is clean and safe and a big money-saver. Explore the Bay Garden and Botanic Gardens at night. They are beautifully lit and can be a memorable sight on your Singapore honeymoon trip.